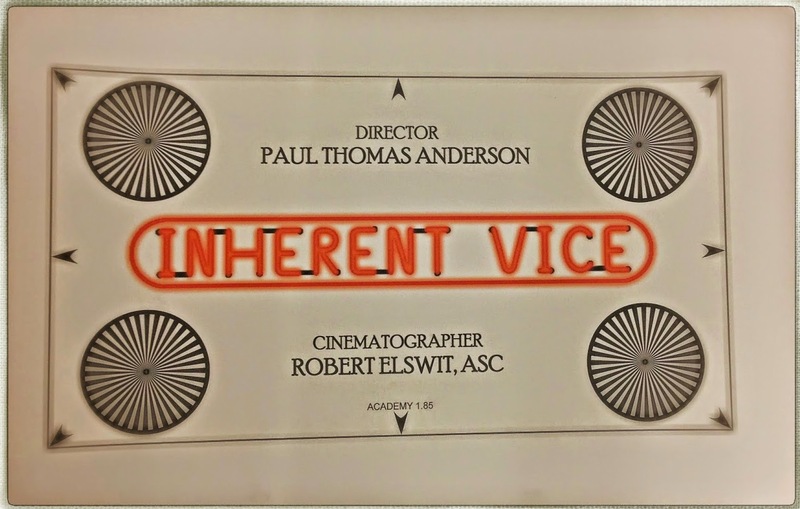 Papergreat: A mighty fine piece of ephemera from the set of "Inherent Vice"
Whoa! Here's some groovy breaking news from the worlds of ephemera and film. Shown above is the framing chart that was used during the production of Paul Thomas Anderson's Inherent Vice.1 The chart is used as the director, cinematographer2 and others work to frame each shot in the movie's chosen aspect ratio (in this case, 1.85:1). Inherent Vice, which is scheduled for a December release, is an adaptation of Thomas Pynchon's novel of the same name.3 The cast includes Joaquin Phoenix, Reese Witherspoon, Josh Brolin, Jena Malone, Martin Short, Benicio Del Toro, Sasha Pieterse and Eric Roberts. For the latest information on the Inherent Vice movie and the filmmaking career of PTA, I direct you to the Cigarettes & Red Vines website maintained wonderfully by CJ Wallis, who kindly allowed me to post the above image. 1. That chart would look very nice framed and on my wall, next to Story Gnome, The Three Bears and some other pieces that have been featured here. A guy can dream, right? 2. The cinematographer for Inherent Vice is Robert Elswit, who won an Oscar for his work as cinematographer on Paul Thomas Anderson's There Will Be Blood. 3. I first wrote about this movie back in May 2013.